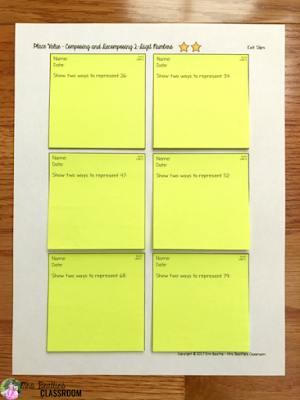 I've been asked several times lately how I print on sticky notes in my new Differentiated Guided Math Lessons package. It really is very easy, and a trick that can be used for many different purposes in the classroom. 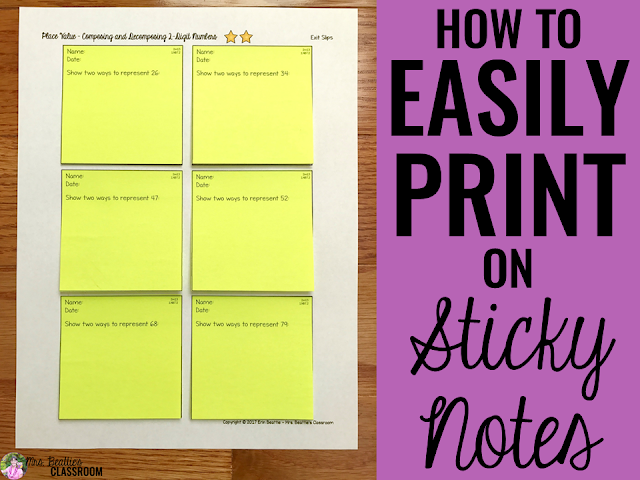 The first thing you need is a printed template of the page you are wanting on sticky notes. 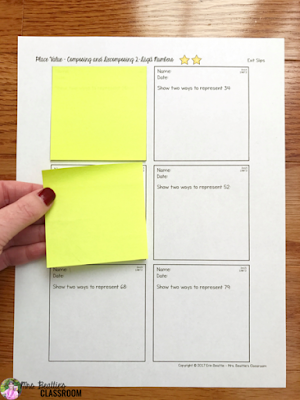 In this tutorial, I am using a page of exit slips. 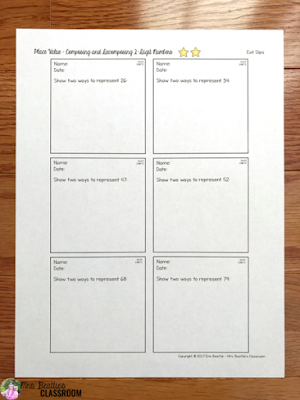 All of the exit slip and observation/assessment forms in my Guided Math Lesson package use this identical template for printing onto 3-inch pages. I like to keep a master copy so that I always have a template available without printing the extra page each time. Next, remove the stickies from the side to prevent the adhesive edge from curling (more on that here) and place each one directly over the template squares. I recommend using the brand-name Post-It notes rather than the cheaper alternatives because not all stickies stay 100% affixed to the paper and you wouldn't want a jam in your printer. Be sure to place all of the adhesive edges toward the top of the page. They will all need to be facing the same way to make it successfully through your printer. 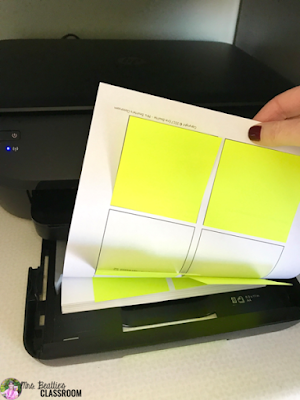 When you're ready to print, insert the page so that the adhesive edge of the stickies (or the top of the page) is being fed into the printer first. In some printers the page will go upside-down, and in others the right way up. You might need to test this out to be sure of how your device works. Finally, print the page you desire! It is as simple as that! Don't forget to keep your template page, unless you are printing something from a completely new template, as future pages will match up perfectly. Need a template for your resources? 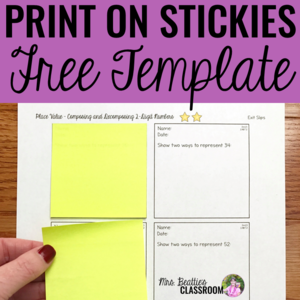 I have an EDITABLE template for personal use in my Free Resource Library! Interested in more time-saving hacks for your classroom and home? Check out the ideas on this Pinterest board! I can't seem to find the template. Thanks for stopping by! The template that I am referring to is actually part of my Guided Math Lessons package, but I think I could add one to my freebie library. If you are an email subscriber you'll have access to it.